We are offering Air Compressors Enclosures. These enclosures suitable for air compressors for full range. Our products are manufactured at par with the international standards of quality. 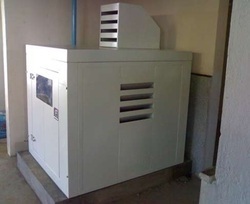 We are leading manufacturer and supplier of Soundproof Enclosures for Air Compressors in Pune, Maharashtra. A sound source is enclosed within a paneled structure such as a room as a means of reducing the noise level at the receiver.Such a room is called as Acoustic Enclosure. 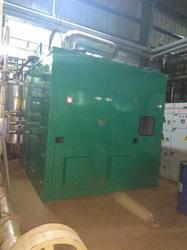 Om Sai Engineers & Co.
We offer Air Compressors Acoustic Enclosure also which are used in laboratories and in Hospitals. All maintenance points are at one side only which ease maintenance of compressor very easy. Exhaust fans are used to control inside temperatures. The types available include both fixed or trolley mounted versions. Sound Reduction achieved to 65 db at a distance of 1 mtr. With thorough expertise and understanding of this industry, we are enormously involved in offering a quality assured range of Compressor Canopies. We are the leading company offering to our clients a comprehensive range of Genset Canopy. These products are accessible among our clients in several standard capacities. Additionally, our offered range is heavily demanded across several industries due to reliability & high performance, noiseless operation and durability.